Back in 2004, Mercedes defined the modern four-door coupe with the very first Mercedes-Benz CLS, which was basically an E-Class intentionally bent out of shape in a tragic styling exercise incident. Now there’s a third generation with an exciting new straight six engine, and it’s a hoot to drive and much easier on the eyes. This new-for-2019 CLS is actually exciting, because it has a new 3.0-liter straight-six engine. Straight-sixes are known and loved for smoothness, and so it’s cool to see this architecture back in a Benz after 20 years of absence. It’s also happily married to one of those 48-volt electrical boost systems, all of which I’m pleased to report is delightful to drive. It’s also the first CLS to have a fifth seat, so you can torture one more person’s hairdo with the lack of headroom in the back from that drooping roofline that supplies the lie that this vehicle deserves its “coupe” branding. Other style elements that carry over from the previous CLS generations are the four frameless door windows and the befuddling mozzarella bulb of a rear end. The 2019 CLS is one of the first cars to reflect the new Mercedes design approach, in a general way, apparent by the eschewing of pointless folds and creases in the metal work for a look that’s smoother, simpler and populated with LED head and taillights shaped to a point at their corners, like paint strokes, for a slightly more aggressive presence. All CLS cars get AMG style touches, like on the standard 19-inch wheels. For whatever reason, the CLS is nearly visually identical to the new A-Class, despite its E-Class level status, the critical difference up front being the grille flourishes. It looks good, to my eyes, but makes it already styled to seem like a lower-tier car than it is. It also doesn’t help to have the four-door AMG GT overshadowing it (now with incredible monoblock wheels). 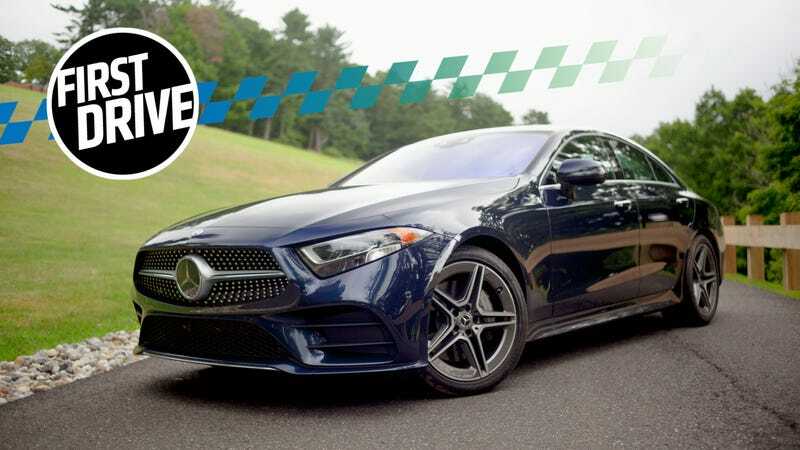 The 2019 CLS 450’s fancy new 3.0-liter inline turbocharged six cylinder comes with EQ Boost, which is an integrated starter-generator motor juiced up with a 48-volt electrical system. You have heard these systems called “mild hybrids.” The engine deals out 362 horsepower, which is boosted up to 383 hp with help from the temporary bursts of EQ Boost, and 369 lb-ft of torque with EQ Boost throwing up to 181 lb-ft on top of that. Every single one of these gets a nine-speed automatic transmission. Mercedes claims acceleration from zero to 60 mph is 5.1 seconds for the rear-wheel drive model, or 4.8 seconds for the rear-biased 4MATIC all-wheel drive car. You are electronically limited to a top speed of 130 mph for your own good. The CLS 450 4MATIC that I drove was spec’d in Lunar Blue Metallic paired with an Grey Ash Wood, Magma Grey and Espresso Brown interior trimmings combo. It was also equipped with high performance tires, a bright and clear heads-up display, adjustable air suspension, soft-close doors, illuminated door sills, heated and ventilated front seats, heated rear seats, and a motorized rear-window sun shade. The standard features include Apple CarPlay, Android Auto, keyless start, power front seats, dual-zone climate control, and ambient mood lighting touches that stretch the width of the dashboard and fill the turbine air vents. There was also a sunroof, power folding mirrors and windshield wipers that could magically detect the rain. Safety features included a rear-view camera, 24-hour roadside assistance, ABS, active brake assist, stability control, a predictive occupant protection system that pulls the occupants toward the center of the car if it detects a side impact collision, driver attention assist that is extremely alarming if you upset it, and crosswind stabilization, which I don’t even think commercial planes have yet. Driving the CLS 450 4MATIC in its Sport+ drive setting is what I imagine a cool early morning jog is like for a hardened marathon runner—a comfortable glide with more than enough power, that occasionally taps into a surge just for the hell of it. On the freshly dampened roads of New Jersey, any potential for playful or unplanned loss of traction is ironed out by the all-wheel drive system, making for a confident, casual driving experience that should perfectly match any expectations someone would have for an E-Class seeking even more attention. The look, the engine, the EQ Boost and the 4MATIC system come together like a well balanced meal of tasty flavors and satisfying textures. Power is suggestive but not alarming, and there’s not quite an engaging driving experience, but it does what you want, feels good and leaves you feeling embarrassingly smug. When putting it down, the power comes on directly and excitedly, and you’re pushed satisfyingly deep into your pored-leather seatback. It’s perfect for those conflicted between giving in to their impatience and treating themselves to a relaxing drive. To think Mercedes got 429 hp out of this engine for the AMG CLS 53 is a lovely thought. The nine-speed auto mostly stays out of your way, though we did suffer through a couple of jolting downshifts together in bridge traffic. The heads-up display is bright, showing current speed, posted speed limit, and navigational directions, which renders the super wide dashboard screen almost irrelevant to the driver while in motion (which is a good thing). The cabin is much quieter than you might initially recognize, which becomes evident the moment you roll down a window. One of the only sounds that gets through is the hard working sighs of the turbocharged engine. With windows down in a tunnel, it’s even clearer that the straight six makes a satisfying chirp under stress. Otherwise, not much of the engine note nor exhaust noise penetrates the cabin ever. The styling of the CLS has always been questionable, or “polarizing” to be more polite, but I’d say this generation is the one I don’t feel uncomfortable looking at. Still, my driving partner described the protruding license plate bumper in the back, as well as the rear-view camera that spins out of the Mercedes logo, as “hemorrhoidal,” and the taillights seem like the obviously fake light stickers you’d find on racing car, which are deceptively flat against the shape of the body. After living with the CLS for a day, I’ve ultimately come to like the overall look. It’s strange enough to catch your eye without going too far away from being comfortably familiar. I’m also relieved to have witnessed quite a few decent paint options, and even more impressive interior trim combinations. The interior touches of the CLS seem slightly confusing. On the 4MATIC I drove, the muted greys and browns were constantly highlighted by pink, aqua and red hues from under the infotainment trim band and air vents, producing a conflicted look. You have 64 color options if you’re willing to take the time to get it right. Mercedes claims the CLS experience should be like a spa, with multiple moods or something in the settings to pick from. Running down the list in the menu, the only noticeable differences were color changes and a sudden audible airflow breeze from behind the front seats that was more confusing than relaxing. I also opted to turn off the Mercedes scent that is included in the spa feature and many of its other cars in the lineup. The brief period it was on left me feeling nauseous, but I am admittedly sensitive to colognes and perfumes, though my co-driver—who took a big whiff of the essence juice—did leave the drive early with similar symptoms. It may have been an unrelated coincidence, as he had mentioned enjoying a very fatty duck dinner the night before. Gear selection, like on other Mercedes cars, is on a stalk behind the right of the steering wheel with Park as a button awkwardly on the end of it, which is probably the least-premium aspect of the CLS, and almost feels like an afterthought. I can’t think of any clear reason for it to not be a series of buttons, or better-yet a dial, somewhere on the center layout of other inputs. If you’re going to make it a stalk behind the wheel, just do a straight-forward column shifter please. Additionally, the current-gear readout is small and difficult to locate on the screen in front of the driver, and could be clearer. Another issue in the same geographic area is how the thick steering wheel cuts off the edges of the driver display screen. With the steering wheel in my ideal position, the top edges of the speedometer dials were obstructed. Another reviewer corroborated this issue at dinner later that night. If I move the wheel up, it cuts into my view of the road just enough to bother me. Speaking of the steering, moving up the driving settings through Sport and Sport+ stiffens up the wheel resistance, but there’s virtually no real feedback. The car, either with the steel suspension or air suspension, is permanently wafty, but is tuned enough to prevent the car from throwing you around inside. Honestly, I think it fits the CLS and is nicely balanced. I’m sure it’s better this way. The new A-Class which debuted last week has a full trackpad input for the infotainment system, which for me is a big improvement over the multifunction dial found on the CLS, which I do admit you could figure it out eventually. I just predict the new family input system will be a welcome change, though I’m not sure if it will make it to the CLS anytime soon. The 2019 CLS 450 is smooth. The design is elegantly smooth, the interior is comfortably smooth, and the straight six engine is powerfully smooth. If you like those hipster shaved-sides, gelled comb-back hairstyles because they make you feel young, you’ll love the design. If you like the idea of a baroque rave, you’ll love the interior. And if you like your engine to whistle while plummeting your slicked-back baroque rave down the road, you’ll love the CLS 450. Comfortable, controllable, quick, and class, with a few interior frustrations. It's a nice ride and cool engine, but then there's the AMG CLS 53.